I was "sweeper" the other day. This is when you ride in the very back of the group and bring up the rear. Needless to say, I have way to much time on my hands. I spotted a skate park and went to go try my hand at it. 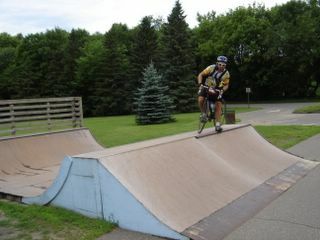 All I can say is, "Dave Mirra has nothing on me!"